Anything you can do to take emotions out of financial decisions is often a very good thing, and DRIPs can certainly help. The best thing about DRIP investing is that it’s a powerful tool that helps you to automate investing. Since the wealth and income compounding power of the stock market requires time and patience, DRIP investing can be thought of as the lazy (but smart) person’s road to riches. DRIP investing is very much a hands-off approach, so it is best used for stocks that are of such high quality and low risk that you don’t need to pay all that much attention to them. In other words, DRIP investing is best done with blue chip dividend stocks, those companies with predictable businesses and durable competitive advantages that have proven themselves to be excellent wealth compounders over time. Popular places to start one’s search for these types of DRIP-friendly companies are the lists of dividend achievers (10+ consecutive years of dividend increases) dividend aristocrats (S&P 500 companies with 25+ consecutive years of rising dividends), and dividend kings (50+ consecutive years of dividend increases). The key to these DRIP candidates is that most of these businesses have proven themselves over decades. Each has steady cash flows to support growing dividends and a shareholder-friendly corporate culture that is dedicated to rewarding investors for their patience over time – no matter what the economy or stock market is doing in the short-term. With a diversified portfolio in place, you can feel comfortable reinvesting dividends back into these high quality businesses. DRIP investing won’t work if you don’t give your investments the time needed for the compounding power of rising dividend streams to work. That means you should only ever DRIP on shares owned in a long-term portfolio. And keep in mind that you will have to pay taxes on DRIPed dividends. For most stocks (basic corporations) that means qualified dividends, which are taxed at the capital gains rate (0%, 15%, or 20%). Owning these stocks in a tax-deferred account, such as an IRA or 401(k), can be an ideal solution to avoid these taxes until you start withdrawing required minimum distributions at the age of 70.5. Also keep in mind that owning dividend stocks on a DRIP plan can be a great way to match up your time horizons. After all, any money saved in an IRA or 401(k) can’t be removed without paying hefty fines until the age of 59.5. This can help you keep your eye on the prize and maintain your long-term discipline. First is the power of exponentially growing dividends to help you achieve strong long-term returns. For example, let’s consider Realty Income (O), which is one of the best high yield monthly dividend stocks. However, while the stock's relatively high yield near 5% is what initially attracts income investors to the stock, the true power of this dividend growth legend comes to those that hold for the long-term. In fact, if you had bought Realty Income at the IPO, and never sold it, then your yield on cost (current dividend/cost basis) would exceed 30%. DRIP investing, with its emphasis on the long term, is a reasonable way to keep your focus on the horizon and avoid the temptation to time the market or let short-term volatility scare you out of an excellent investment. For example, Enterprise Products Partners (EPD), one of the best midstream pipeline MLPs, offers up to a 5% discount on its units for DRIP participants. There are two main ways to set up a DRIP, through your broker or individually by company through a transfer agent such as Computershare, which many businesses use for DRIP programs. 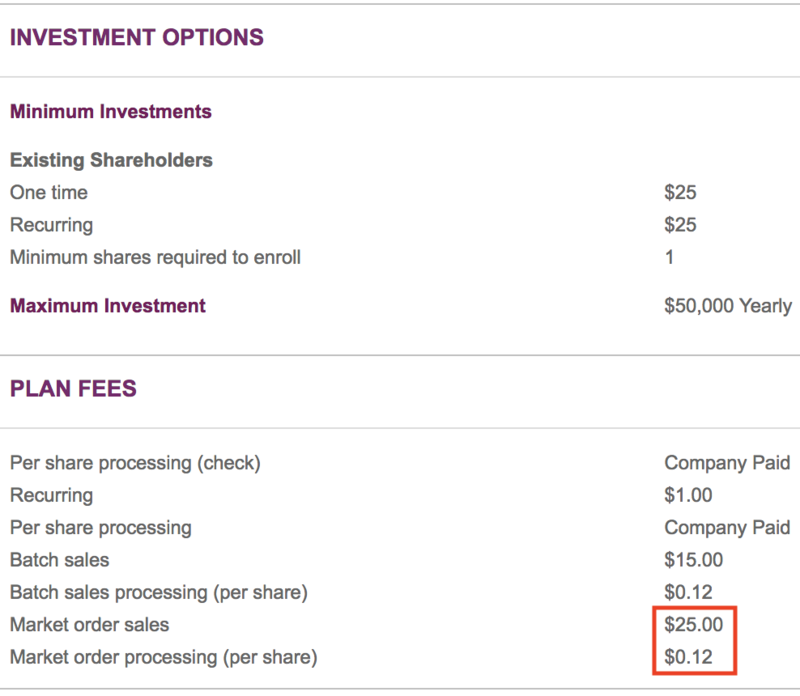 For example, as you can see below, using Computershare to set up a DRIP with Johnson & Johnson (J&J) involves numerous fees, including a very steep commission to sell your shares, $25 plus 12 cents per share. That’s because valuation matters, and even high-quality blue chip dividend growth stocks can run up and become overheated. Blindly DRIPing every stock virtually guarantees you will be purchasing some shares of overvalued companies, which increases risk of underperformance. Instead, you would need to pool your dividends for a time (say a month or a quarter) and then redeploy that cash into whatever appears to be the most undervalued at the time. As you can see below, from 1996 through 2015 stocks returned 8.19% per year, yet the average investor woefully underperformed with an annual return of just 2.11%. In today’s age of ever more popular and low-cost exchange traded funds (ETFs), what explains the fact that most people’s portfolios haven’t even kept up with inflation? The answer is that, even in today’s golden age of high-quality market data, human nature is still getting the better of us. Emotions are causing most people to overtrade, including with low-cost ETFs that track the broader market. This is understandable because over the last few decades psychologists have found that humans brains are naturally hardwired to feel the pain of losing $1 twice as much as the pleasure of gaining a $1 (an evolutionary benefit that is now working against us in investing). As a result, people naturally attempt to minimize losses and essentially attempt to time the market. However, market timing is the best way to ensure you waste the market’s compounding power. Since DRIP investing is merely an automation tool that you generally set up through your broker, it can’t save you from yourself if you intentionally sabotage your results through market timing and overtrading. In other words, DRIP investing only works over the long term, which is why, as with dividend growth investing in general, what matters isn’t market timing but time in the market. That’s due to the plethora of quality research tools, low-cost brokers, and ways of automating one’s long-term investment strategy. However, at the end of the day DRIP investing is just a tool and not a guaranteed way to riches or success.